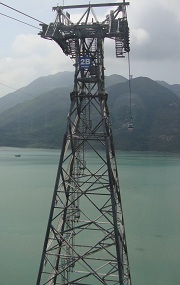 Ngong Ping 360 is a Cable Cart ride in Tung Chung, Lantau Island. 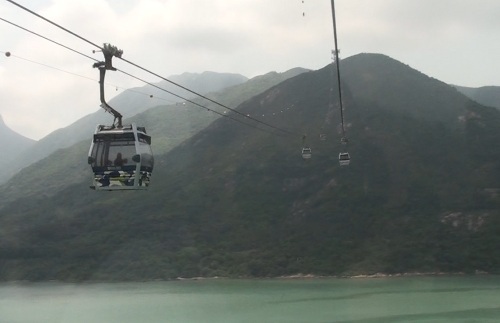 It’s a very popular tourist attraction that transports people from Tung Chung MTR station to Ngong Ping Village and the nearby Po Lin Monastery and Tian Tan Buddha.Ngong Ping 360 consists of cable carts (also known as Gondolas) that ride across two metal ropes held up by 8 towers spread out along the ride. The whole ride spans across the Tung Chung Bay, goes over the mountains on Lantau Island that lead to Ngong Ping Village. The entire distance of the ride is 5.7 kilometres and takes about half an hour to ride all the way across. The number 360 in Ngong Ping 360 stands for the 360 degree view available to you inside the cable cart. You have 2 choices in cable carts to ride. There are standard cable carts, as well as another type of cart called the “Crystal Cabin.” The Crystal Cabin carts have a glass floor that allows you see everything underneath you during your ride. The Crystal Cabins were the first carts to have one piece of glass that spans the entire width of the bottom of the cart. It might be a little scary for some people to ride in this, so make sure everyone you’re travelling with is ok with the transparent glass floor before riding in it. The Crystal Cabin carts cost more to ride in than the standard cable carts. 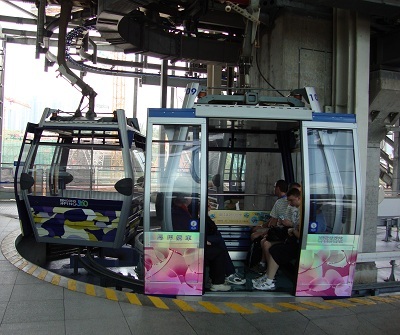 Maximum capacity of standard cable carts is 17 people (10 seats and 7 standing) and 10 people (all standing) for the Crystal Cabin carts. If you go during a time that’s not very busy, there’s a good chance you could get a cart to yourself or at least get a seat in the cart. The ride in the cable cart is very relaxing and scenic. As you ride along you can see the Tung Chung Bay underneath you. Sometimes you’ll even see people out there fishing. As you keep going you’ll pass over a big mountain which leads to Ngong Ping Village. The views from up in the cable cart and the unique experience is well worth the price of admission. There’s a hiking trail that goes from Tung Chung to Ngong Ping Village. At one time this used to be the only way to get from one side to the other. Sometimes you can see people walking along the hiking trail that leads across the mountain. As you get closer to Ngong Ping Village you’ll be able to see the giant Tian Tan Buddha. It’s so big you can see it from very far away. Just before you arrive at the terminal, a camera will take your picture. You can see the picture of you and your friends/family riding the cable cart at a kiosk after you get off the cart and leave the loading zone. You can purchase your picture at this kiosk. They have lots of different things you can buy like specific size pictures, fridge magnets, key chains and more. You can even email your picture from their computer on site. Ngong Ping Village is a unique, culturally themed village. You can find lots of shopping, restaurants, and some attractions here. The restaurants range from traditional Chinese cuisine to western food. The shopping is mostly souvenir shops. Things are a little pricier here because you’re at a tourist spot. The attractions include Walking with Buddha and Monkey’s Tale Theatre. Walking with Buddha takes you through the life of Siddhartha Gautama, the man who created Buddhism and eventually became Buddha. Here you can learn about Buddha’s teachings and experience his journey to enlightenment. Monkey’s Tale Theatre is a show with cartoon Monkeys that shares some of the famous Buddhist Jakata stories in a humorous way. 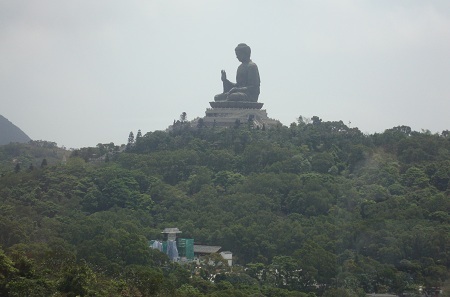 The Po Lin Monastery and the Tian Tan Buddha are only a short walk away from Ngong Ping Village. Once you’re done in the Village, make your way over to these 2 popular attractions. There is no meat or alcohol allowed at the Po Lin Monastery or Tian Tan Buddha. If you want to have an alcoholic drink or eat food with meat in it, make sure to have it before you leave Ngong Ping Village. You’ll only find vegetarian food once you leave the village and head toward the monastery. Ngong Ping 360 is very close to the Hong Kong International Airport. As you ride in the cable cart you might be able to see an airplane or 2 taking off or landing. If you have a long stop over at the Hong Kong International Airport, you can take a 10 minute bus or taxi ride to the Tung Chung MTR station. From Tung Chung Station its only a few minutes walk to get to at Ngong Ping 360. You can also find shopping at the Citygate Outlets which is only a couple minutes walk from Tung Chung MTR Station as well. You can easily spend your waiting time at an attraction or shopping instead of sitting in an airport terminal. It’s a very convenient spot for a tourist attraction since travellers don’t have to go very far from the airport to see it. The Hong Kong Disneyland interchange station (Sunny Bay MTR Station) is located only 1 MTR station away from the Tung Chung MTR Station. So you could easily visit Hong Kong Disneyland if you finish seeing everything you want to see at Tung Chung early enough in the day. The busiest times of the year in Ngong Ping Village are Chinese New Year (sometime between January-February), Christmas, and Buddha’s Birthday (usually between late April-May). 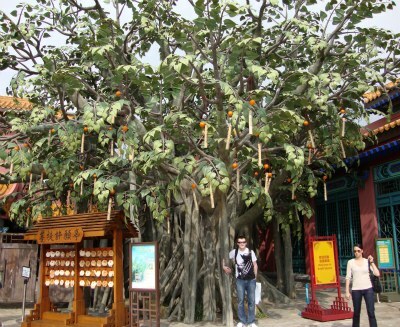 Ngong Ping 360 is a fun experience that has become very popular since it opened in 2006. It’s a peaceful change from the fast paced city streets in Kowloon and Hong Kong Island.